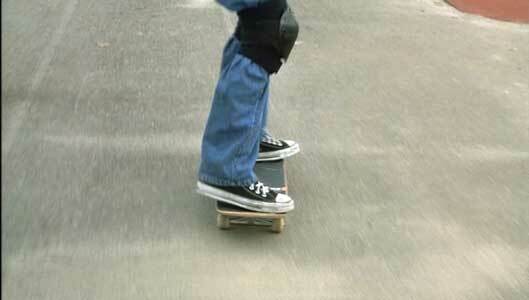 Tom Guiry wears maroon and black high top Converse “Chuck Taylor” All Stars in the film. 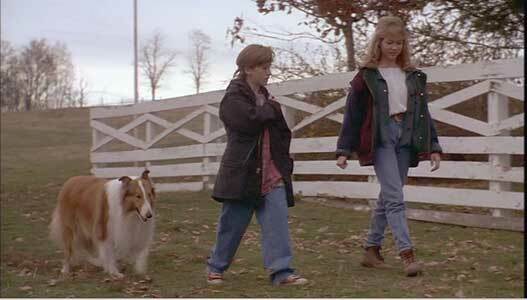 The classic story of a boy and his dog gets an update in this 1994 film version. Lassie is a 1994 film that updates the classic Lassie Come Home film of the forties and the television series of the fifties and sixties. The story focuses around Matt Turner (Tom Guiry), a young teenaged kid from Baltimore who sports a headband, earring, rock t-shirts and high top chucks, and displays a negative attitude about most things. Matt’s main interests in life are skateboarding and listening to heavy metal music as a way to tune out the rest of the world. This is partially due to some hard times that Matt’s family has gone through. His mother has recently died, and his father Steve (Jon Tenney) has not been successful with his construction business. Steve has remarried a very nice lady named Laura (Helen Slater) but Matt has not warmed to her because he has yet to fully accept the loss of his mom. Because Matt doesn’t have much joy in his life, he tries to debunk anything he considers to be a myth in front of his little sister Jennifer (Brittany Boyd), In one of the films little ironies, Matt yells at Jennifer and changes the channel when he catches her enjoying an old “Lassie” episode. Matt’s attitude about life is not improved when Steve announces that the family is moving to a rural Virginia ranch owned by his former wife’s family, because he has been able to land a house building contract that Matt’s grandfather Len (Richard Farnsworth), who lives there, helped him obtain. On the way to Virginia, the Turner family comes across the scene of a fatal accident between a truck and a train. Out of the back of the truck, comes a magnificent collie, who assessing the situation, immediately begins looking for a new family to live with. The dog spies the Turners, especially Jennifer and Matt, and comes up to them. Jennifer immediately shouts, “Look, it’s Lassie!” and wants to adopt the dog. Matt is appalled, again saying that there is no such dog as Lassie, and Steve is also against picking up a stray dog. The Turners drive away to a local restaurant to eat, but Lassie is not to be denied. She follows them to the restaurant and barks at them. This time Laura agrees with Jennifer that they should keep the collie. Steve reluctantly agrees, and Lassie jumps into the car. 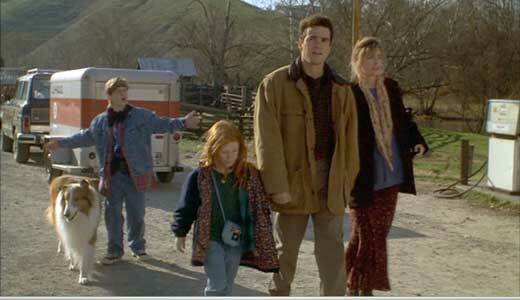 When Matt and his family arrive at Franklin Falls, he can’t believe how small the town is in comparison to Baltimore. When the Turners arrive at their destination, near the small town of Franklin Falls, Matt hates everything about it. The farm has no electricity at first, the property is run down, and there is no place to skateboard. He retreats to his room and escapes by listening to his portable CD player rather than exploring the magnificent property. But Matt hasn’t reckoned with Lassie. She grabs his headphones and leads him on a chase through the ranch until they come across the swimming hole, complete with a tree rope so you can jump in. Once Matt takes the plunge, his whole attitude starts to change, and under the guidance of Lassie, he starts to appreciate the country life. At school, he meets April (Michelle Winters) an attractive girl who raises animals for the 4H club, and when Matt and Lassie stumble on an orphaned lamb, she shows him how to care for it. Meanwhile, the construction job his dad was supposed to get has fallen through, and all Steve can get is work stringing barbed wire fence wire for $5 an hour. When he receives a job offer back in Baltimore, he is ready to pack up and leave. But Steve is surprised to find out that Matt wants to stay. The reason is because Matt found a diary in his closet kept by his mom as a child. In it, she described her dream of raising sheep on the ranch and owning a collie named Lassie. So he persuades his dad, with the financial assistance of his grandfather, to upgrade the ranch and begin raising sheep, with Lassie keeping the herd in line as sheep dog. When the work is completed and the first herd acquired, it seems that the Turners are finally on the road to success. However, trouble looms next door. Their neighbors, the Garlands, have the biggest sheep raising operation in the state, and are resentful when the Turners fence off their land that the Garlands have been using illegally for grazing purposes. Additionally, one of the Turner sons is a rival for April’s affections, and tries to put Matt in his place. The conflict between the two families occupies the remainder of the film as all of the heroism and determination of Lassie is put to the test by the Garlands. Matt starts to develop a friendship with April, who shows him how to care for sheep. Although produced by Lorne Michaels of Saturday Night Live, Lassie does not have comedic or satirical elements at all, and contains the same wholesome qualities as the television series did. Lassie still is the all knowing dog who can manipulate humans to do the right thing, and sense and respond to dangers as they occur. She quickly works to change Matt’s attitudes about life, transforming him from an isolated, spoiled nineties kid with no sense of wonder or appreciation for nature into an advocate for country living and family values. The only thing that stays with Matt is his nineties dress code and fashions (imagine the reaction to Matt and April exchanging ear rings or Matt wearing his headband and maroon high top chucks to school if this were the old series). Although the film has the usual cliches and predictable plot, it has been given the full Hollywood treatment this time, with stunts and fights, a dramatic orchestral score, and beautiful cinemaphotography. The film does grow on you; after all who doesn’t like a good dog story? Tom Guiry gives an intense, on the edge at times performance as Matt. If you weren’t caught up in the emotions of the story and the way that his relationship with his family and Lassie changes, his adolescent voice would probably get on your nerves. The rest of Matt’s family is storybook, perfectly cast as the “average” family, and the villains wear black hats, smoke or chew tobacco, and perform dirty tricks, but turn out to be not so bad after all. The dog who plays Lassie is great doing heroic dog actions as well as interacting with humans. In other words everything you would want and expect out of a Lassie film is here -- a satisfying experience for the whole family. 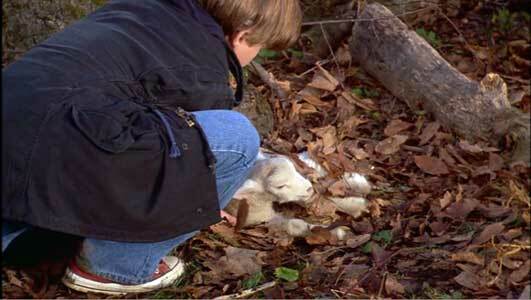 Lassie persuades Matt to rescue an abandoned lamb whose mother was killed by a coyote. Matt skateboarding in a Baltimore park just prior to leaving for Virginia. 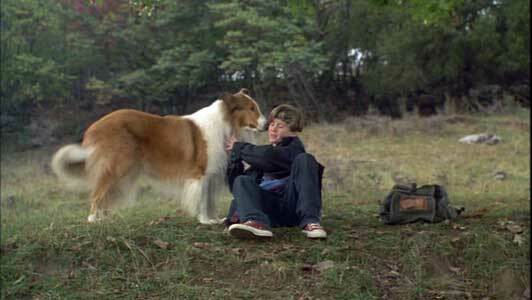 Tom Guiry in his leading role as Matt Turner wears high top chucks throughout the film, either black, or during the middle of the film maroon, thus keeping up the tradition of Jeff and Timmy that was established during the different television series versions of Lassie. 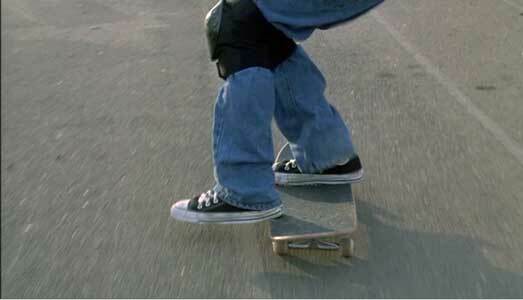 Chucks look cool in the beautiful Clinch Valley (Southwestern Virginia) setting of most of the film, but the sequence with the best chucks closeups is the skateboard scene at the beginning of the film. Matt tries some flips and turns on his skateboard. Lassie. (1994) Tom Guiry, Helen Slater, Jon Tenny, Brittany Boyd, Frederic Forrest, Richard Farnsworth, Michele Williams. Directed by Daniel Petrie. Categories: Family, Drama, Coming of Age.